Indicate to dog owners that your lawn is not for their pets' use with these Esschert Design White Cast Iron Dog Yard Signs. 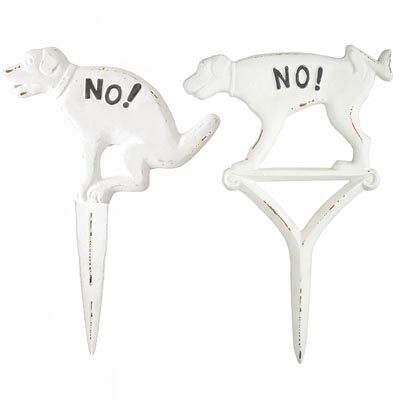 The dog figures on these 2, cast iron signs are in immediately recognizable elimination positions, and the word "NO!" in all caps with an exclamation point makes your meaning quite clear. The distressed white tone of each item contrasts your lawn, and a pointed stake on each inserts into soil with ease. Their cast iron construction keeps these items hardy and durable for many seasons, and the black tone of the raised phrase on each captures attention in moments. Prevent dog owners from allowing their pet to eliminate in your grass with these White Cast Iron Dog Yard Signs.